The Green Gym works on several places on the common around Nettlebed. 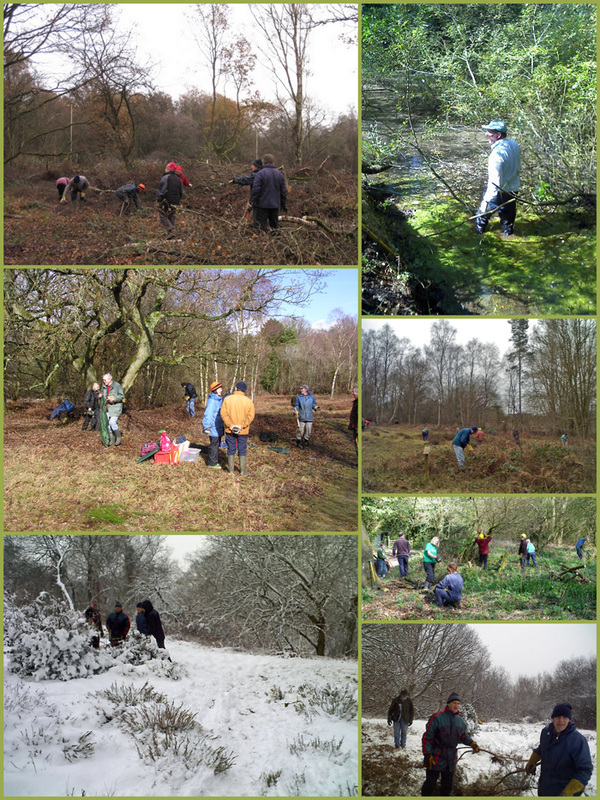 We maintain heather, ponds, paths and do general clearance in the woods and open spaces. Even the snowdrops get special attention so they can thrive and create an early spring display. Joyce Grove Triangle: We have started clearing felled timber from this new site near the centre of the village, where it is intended to restore the open grassland that existed here about fifty years ago. Priest Hill: Work continues on this heathland site, which is similar to that at Kingwood Common: Removing bramble, bracken, and birch saplings to enable Heather to regenerate. We are extending the area of wet heathland, which harbours rare sedges and mosses, as well as reptiles. Work has started on creating an easy access trail with ‘interesting’ trees en route providing opportunites for play. The trail passes near to Jacks Pond and around the north side of the recreation ground, and will open up a flat terrace in the woods which overlooks the cricket pitch.